KITCHENCRAFT Milk Frother Probe Thermometer Cappucino/Latte/Coffee. Easy to Use. Superb quality as you would expect from KITCHENCRAFT. Just insert the spike into your Milk, angle it so you can see the dial at a glance and leave it in while heating your Milk either with a Coffee Machine or on the stove. Kitchen Craft stainless steel milk frothing thermometer Stainless steel thermometer designed for measuring the temperature of milk and frothed milk for use when making and serving drinks Easy to read Celsius and Fahrenheit dial has the ideal frothing temperature outlined Clips easily to the side of a jug or saucepan to monitor the temperature as the milk is being warmed / frothed Colour: Silver Size: Length 140mm, Diameter 45mm, Probe 110mm . Kitchen Craft fridge and freezer thermometer Keep food fresh and usable for longer Includes suction cups to attach to the fridge and freezer Measures temperatures from -30° to 30°C and -20° to 80°F Colour: Silver/Clear Size: 12cm . 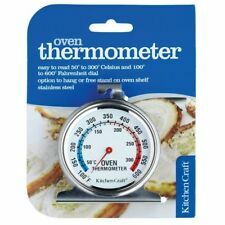 Kitchen Craft stainless steel oven thermometer Easy to read large dial and stylish polished stainless steel casing Measures temperatures from 50° to 300° Celsius and 100° to 600° Fahrenheit Hang inside the oven or free stand on the oven shelf Colour: Silver/White Size: 7.5cm . Master Class digital fridge thermometer Easily regulate the temperature of your fridge With stand & magnet for variety of storage options Easy to read LED display Measures between -19°C to 50°C Colour: Silver Size: 7.5cm x 7.5cm . 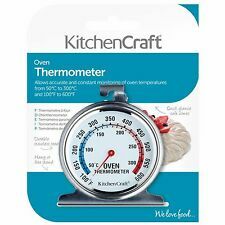 Kitchen Craft digital cooking thermometer & timer Featuring heat resistant wire & stainless steel probe LCD display on the outside Measures 0 - 250 degrees Battery required Colour: Silver/Black . 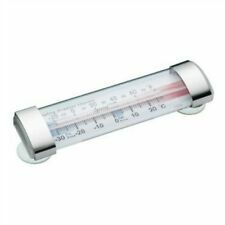 Kitchen Craft stainless steel fridge thermometer Keep food fresh & usable for longer Measures temperatures from -30° to 30° celsius & -20° to 80° fahrenheit Colour: Silver Size: 7cm x 8cm . 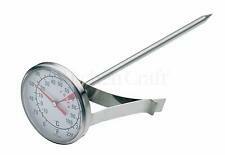 Master Class fridge & freezer thermometer Simply hook onto a shelving rail or place in the fridge Measures between -30°C to 30°C Stainless steel Colour: Silver Size: 10cm . Master Class folding digital thermometer Cooking thermometer with stainless steel probe Precise cooking of beef, veal, lamb, pork, chicken & turkey Features an easy to read LCD display Temperature range from -45°C to 200°C & -49°F to 392°F Colour: Black Size: 11.5cm x 3cm x 2cm . When not in use, the protective sheath will also keep the probe clean. And 100° to 600° Fahrenheit dial. Twin suction fixings for mounting on inside wall of fridge or freezer. 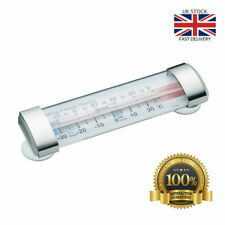 Suitable for seeing at a glance the temperature of your fridge or freezer. Black printed scale shows temperature in degrees C bottom scale or F top scale. Master Class digital infra-red thermometer Easy to read lcd display Compact for easy storage Battery operated Measures temperatures from 0°C to 250°c Colour: Black Size: 10cm x 10cxm x 9cm . Kitchen Craft digital probe thermometer For precise meat and poultry cooking Instant digital readout of inner food temperature Easy to read LCD screen with a temperature range: -45°c to 200°c / -49°f to 392°f Protective sheath to keep probe clean when not in use Colour: White Size: 8.8cm . Spoon section is dishwasher safe. Home Made silicone thermometer spoon Measures temperatures from 20°C to 220°C Requires 1x LR44 button battery (battery included) Ideal for stirring and monitoring the temperature of jams, preserves and delicate sauces Colour: Red Size: 32cm x 6cm . Perfect in the kitchen for Cakes, Roasts, Breadmaking etc etc the end is limitless. Easy to use and keep hygienically clean. Three large on screen buttons with a wipe clean surface and large easy to read digital display. Includes a convenient hanging hook. Requires 2 x AAA batteries (not included). Digital unit is wipe clean only. For perfect froth for cappuccinos, liquid should reach a temperature of between 65 - 70C (149 - 158F). The barista's best-kept secret. When the dial hits the red 'froth' zone, your milk is at the ideal temperature for delicious caf-style coffee. Featuring heat resistant wire and a stainless steel probe. Battery required. The barista's best-kept secret. When the dial hits the red 'froth' zone, your milk is at the ideal temperature for delicious café-style coffee. No risk of overheating! Suitable for steam wands or for heating milk on the hob. Countdown from23 hours 59 minutes. Kitchen Craft Bar Craft. Easy read dial shows ideal temperature for red, white wine and champagne. Wipe clean only and carded. Simply hang or stand in your oven, and read it through your oven's viewing window. No buttons, batteries or tricky instructions! 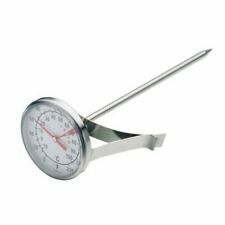 Home Made jam making thermometer Suitable for sugar, jam and deep frying Made from glass & stainless steel Features an adjustable pan clip Reads from 50°C to 200°C Colour: Clear . Easily regulate the temperature of your fridge or freezer for safe storage of contents. Size: 10cm (4") dial. Large, clear dial makes it easy to read the temperature at a glance. So easy to use, with no batteries needed or fiddly buttons! If there's a problem, just let us know and we will fix it. Simply insert the probe and an alarm will sound when the required temperature has been reached. Blister card. Size: 22cm. The acceptable temperature range for the fridge is 2°C to 4°C and for the freezer is -18°C. Ranges from -25°C to 40°C. Featuring a stylish polished stainless steel casing and an option to hang inside the fridge or free stand on the fridge or freezer shelf. The acceptable temperature range for fridge storage is 2° to 4° Celsius and 35° to 40° Fahrenheit. 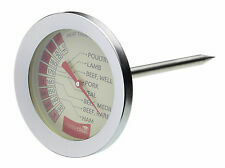 Master Class deluxe stainless steel large meat spike probe Regulate the temperature of meat cooking in the oven Simply stick the thermometer into your joint of meat to ensure that it is roasting to your desired temperature Measures between 54°C to 88°C, with large easy to read dials Colour: Silver Size: 7.5cm . 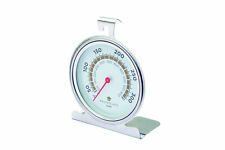 Reads from 60°C to 200°C with clearly marked cooking temperature points. Size: 5cm x 30cm. Kitchen Craft plastic wall thermometer Measures temperatures from -35° to 50° celsius & -30° to 120° fahrenheit Traditional plastic design Colour: White Size: 20cm .